1 The subject does not fill the focus point. 2 The subject contains many fine details. The Nikon D7000, a digital single-lens reflex camera, announced in September 2010, is an upgrade of the Nikon D90, but you can hardly call the D7000 an amateur camera. Really, features of the professional D300/D300s, referring to the functionality, body design, layout of the controls, and materials used, are too evidently discerned in the Nikon D7000. The Nikon D7000 is based on a new 16-megapixel CMOS sensor. Apparently, it is thanks to this the Nikon D7000 features the continuous shooting speed of 6 fps, the 1080-pixel Full HD movie recording at the 24-fps frequency, and the upper sensitivity limit of ISO 6400 with the possibility of expanding the range of another two steps up to ISO 12800 and 25600. In addition the D7000 has a new exposure metering system based on 2016 points, the auto-focus with 3D-tracking function, implying tracking of objects in the frame using the information on its color, etc. The top and back panels of the D7000 body are made of magnesium alloy providing strength and durability of the camera. The Nikon D7000 is resistant to dust and splashes, allowing you to shoot in any weather conditions. User friendly control panel makes the job of the photographer easier and more exciting. Almost all of the control elements are located on the body, so there is no need to search for a desired function in the menu. "Hot keys" are at hand, more precisely in the areas of fingers’ reach, so switching of shooting modes as well as changing their settings is a matter of seconds. 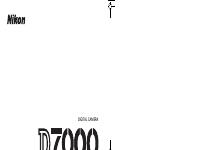 The D7000 shutter maintains 150,000 cycles (in the D90 – 100,000cycles), and this is a professional level. The same level is emphasized by other structural elements of the camera, for example, the controls locks. Their task is to prevent from an accidental shift of a lever, a head, or a dial and the associated changes in the custom setting. There is also the lock, excluding the shift of the active AF point. There are 39 such points in a new AF module. So many points are needed to reliably track the movement of an object within the boundaries of the frame. You can reduce the number of operating points from 39 to 11, using a special setting. You can also set the AF zone as a single-point, dynamic (with 39, 21 or 9 points) and dynamic with 3D-tracking, which uses more information about the color of the object. One more option of the Nikon AF system is lock on, implying that even if the main object is overlapped by another one for a moment the camera still keeps it in the field. The sensitivity of the D7000 lock on feature is customizable. The Nikon D7000 has an excellent pentaprism viewfinder with 100% field coverage, and the magnification of 0.94X. The large 3-inch LCD display with the resolution of 921,000 pixels and a wide viewing angle of 170 covers 100% of the frame and enables to view the smallest details of your photos. Images can be viewed in the Live View mode. The LCD is equipped with a special protective removable cover. The 16.2 megapixel resolution of the Nikon D7000 lets you take pictures of unique precision, and even with repeated magnification the quality of photos will not suffer. Superior sensitivity up to ISO 25600 makes it possible to shoot in dark and dimly lit rooms. The sensor features the dust removal function, which in combination with the Capture NX 2 program, makes it possible to forget about the problem of the matrix pollution and deterioration of the shots with dust particles. The EXPEED 2 processor runs superfast and ensures color and tone accuracy. 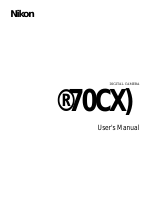 Some more important points: the D7000 has a dual slot for the SDXC memory cards; you can connect GPS-module; and the maximum rate of continuous shooting is 6 frames per second. All in all it is evident that the amateur professional digital SLR camera is not nonsense, it is the Nikon D7000.